Vladimir Putin, the Prime Minister of Russia who is now back as the President, is a man of action, and a quick thinker. His hands show a personality that is impatient, of a man who wants results, not talk. The only profession he is suited to, is a managerial one, where he manages not just people, but events and changes. According to his hands, he was certainly the right man to oversee the massive changes that Russia went through as he took over the reins as the President of Russia in 1999, mainly because of his ability to get things done. There has been some criticism about his methods, with many believing that he is fascist, and there are fears that he might go back to some of the old ways. Once we interpret his hands we can find out if this criticism is justified. good understanding of people, and of issues, quite clear from the overall shape of his hand and fingers. He has a broad palm, short fingers, the typical "square" shape of the hand. 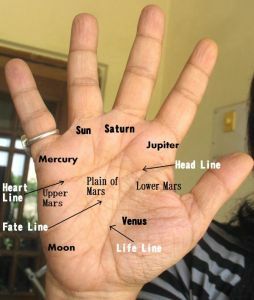 Relatively speaking his Mercury (little) finger is long, and the Jupiter (index) and Mercury fingers are conic-tipped, along with the thumb. The thumb is not particularly long, and the second phalange is a bit thick. His fingers overall are a little thick, with long phalanges. The heart and headlines though are well balanced, and not excessively long, although the quadrangle is narrow underneath the middle fingers as the heartline dips down. The mounts of Moon and Venus well developed and the hand is stiff. These hand features show that Putin has ideals, and love for his country and people. He is patriotic, and certainly, his intention is to see Russia become a leading nation. However he is not a true visionary but could have been if it wasn't for some ingrained shortcomings. His cautiousness and conservatism when it comes to his ideas and their implementation, is a weakness of character. Even though he wants to get things done, he is a man in a hurry, and then his views may be on the conservative side. He is not an independent or revolutionary thinker. Down to earth he may be, but he lacks diplomacy and can be unreasonably stubborn and inflexible. If he does adapt, he will do it if he thinks it is necessary and practical. He probably found it difficult to see another point of view but this aspect has softened. He is a good political leader, not just because he has the interest of his country at heart, he genuinely cares for his people and can be compassionate. His hand shows warmth of personality. Besides, he understands people, and can be quite shrewd and clever. He has a sharp, adroit mind, and is articulate and intellectual as well, although he can be quite blunt. He may not seem aggressive on the outside, but is actually very pushy and tough mentally. Yet he has a sensitive side. His hand shows that he is not particularly a materialistic person, and nor does he hanker after status symbols. He is a simple man at heart. Restless he is, and also a bit of a loner. Overall his hand tells us that he can be a good leader, but cannot be considered a world leader. Check out the hand reading of another Russian: Maria Sharapova's hand reading Hand Analysis or other Politicians from different parts of the world. I do not know much about him, but whatever little I have seen of him and heard, makes me respect him. True, he has a good image in India. I too have respect for him, but somehow don't trust him entirely. However there was nothing shady as such in his hand. I find the most unusual thing about his hand is the extraordinary length of his Mercury finger. He is a talker- and his childish pride is dangerous. Love your site!